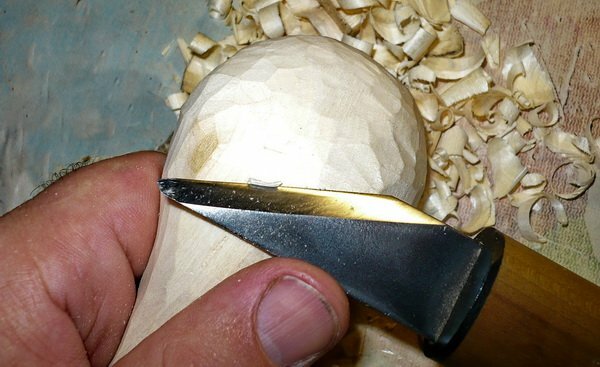 There are so many ways to go about carving a spoon. Here three different carvers share their methods. The Carving Shed on Orcas Island welcomes people of all ages on Sunday mornings. 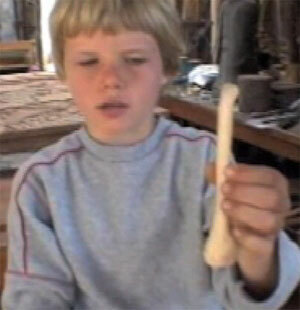 Kajetan started showing up and quickly demonstrated a great natural ability to carve. So I arranged with him to shoot some video of him carving a spoon in trade for a few of my knives. 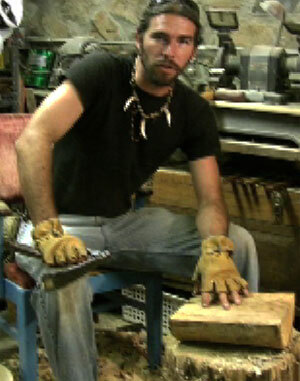 Justin shows what can be done with an adze and a few knives. He is an accomplished wood worker. A novice shouldn't expect to achieve the same results right away. 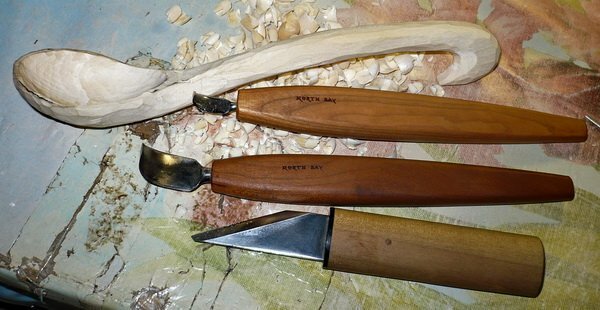 A few years ago, some carvers from Russia started buying my bent knives. 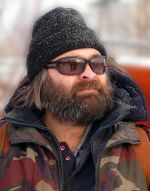 One of them is a very well known carver (Sergey Appolonov) who wrote an article on spoon carving. With his permission, I had it roughly translated, below. I hope you enjoy it. Be sure to catch the video at the bottom of this page! 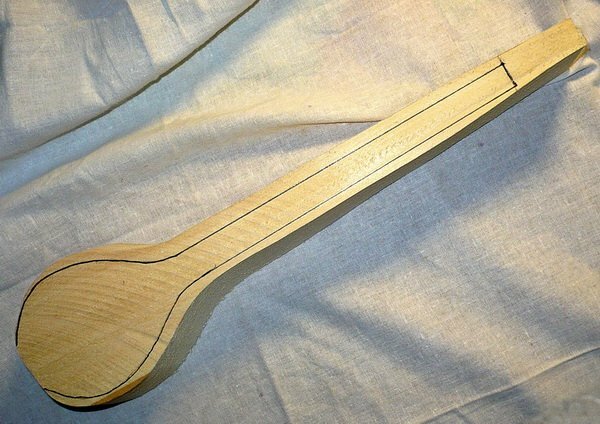 20 years ago I made my first spoon, the simplest one. I got so much interested in this business that I can not stop carving. For 12 years there haven't been two identical spoons. 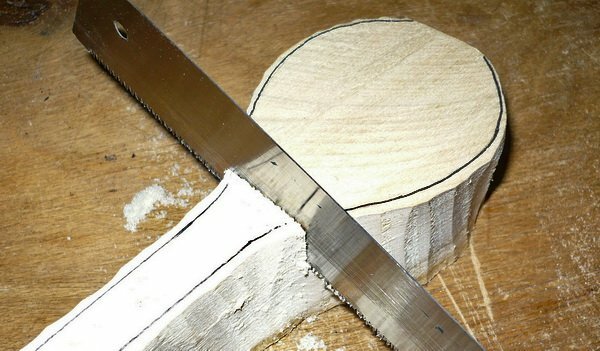 When I take a piece of wood I do not know what kind of spoon will appear at the end of the work. 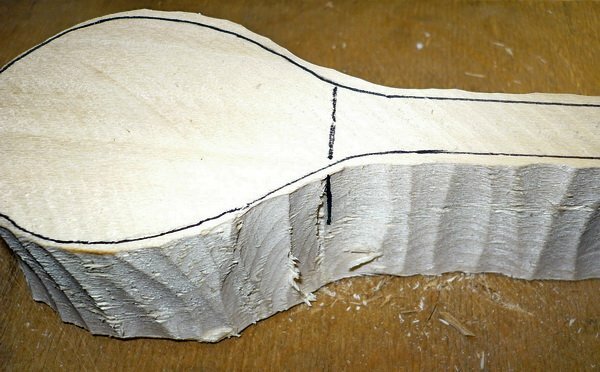 In each piece of wood a different spoon is hidden. The main occupation of mine is studying herbs, and I spend a lot of time in the wild nature. 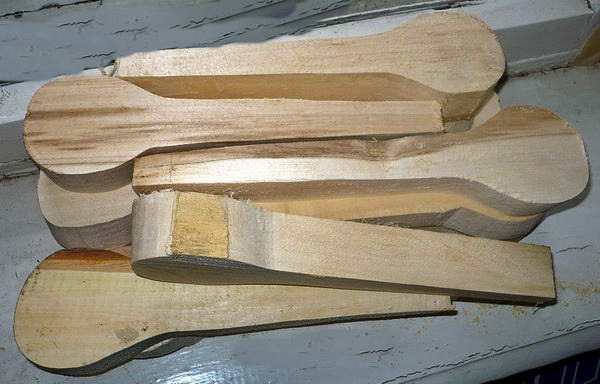 We trace a contour spoons (top view) on wood sample. By the way, I prefer a branch of tree, and in general, a sample with a strongly pronounced structure thank to which it is possible to beat this or that form of a spoon. I cut off pieces on a contour. Then I plan a place of a bend of a scoop, we spend in this place a line a pencil or a marker. I saw the noted inflection point of scoop. You be attentive in order not to saw off the excess. After I made cuts saw, I sketch the outline of the spoon, side view. As the model you can take finished figure or devise new author's form. Now with the aid of shallow bent knife I cut off excess tree on the drawn outline. It is very important to work by sharp tool, observing safeguards. It is not necessary to attempt to immediately cut off much tree, cut gradually. 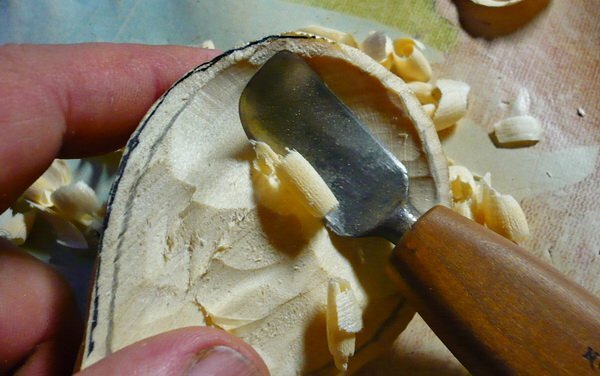 How to be told in Russian proverb "the Chicken eats one kernel behind another and satisfies hunger"
Further, by a knife it is rounded all corners and roughnesses giving to a spoon the finished form. 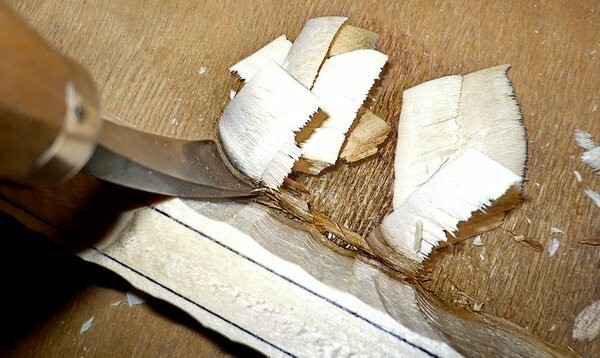 As a result it is received almost ready spoon, it is necessary to cut out only a cavity and it is possible even to eat such spoon soup and porridge. Now has come to cut out time a spoon cavity. For this purpose to be necessary the bent two-edged knife. Since I have opened for myself this knife, I use exclusively it, improbably convenient tool for spoon-carvers! Cutting off a superfluous tree with scooped spoons, it is necessary to be especially attentive, working as two hands, it is necessary to hold with the left hand a knife not to admit failure! 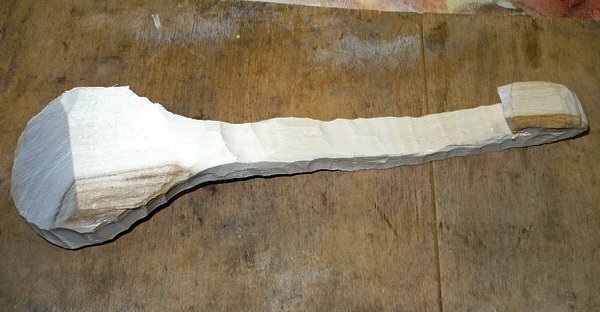 So, having cut out scooped we receive almost ready spoon which can use. Further to be necessary for me the abrasive paper of different granularity and a grinding fibre. The more carefully we have worked as knifes, the it is less time to be necessary on final processing of a spoon. After processing by an abrasive paper, it is necessary to pour some times over a spoon water. Water lifts pile and reveals roughnesses, we again grind them and so until pile will not cease to rise and the surface will remain smooth and shining. For soft breeds of wood it is required from four to five such water procedures.